Multi - Attribute third party certification for environmental attributes of Metropolitan Ceramics quarry tile. Green Squared is North America's first sustainable product program written exclusively for tiles and tile installation material. Green Squared involves the sustainability product standard ANSI A138.1 and the third party certification to that standard. 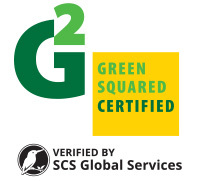 Metropolitan Ceramics is your source for Green Squared Certified ceramic quarry tile. Ironrock, maker of Metropolitan Ceramics quarry tile, has gone through the certification process with SCS - Scientific Certification Systems - and has had a number of products Green Squared Certified.